Back in the Summer we started work on redecorating our ground floor. 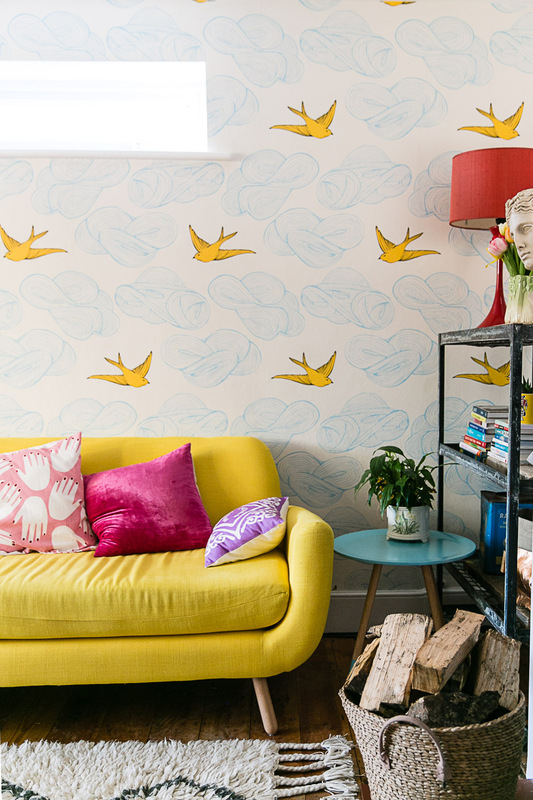 We enlisted the help of B&Q and Valspar to bring colour into our spaces. It wasn’t until I posted the photos for the initial post that I realised how lazy we had been over the decor in the heart of our home. While we managed to get wallpaper up early on the rest just happened with little thought or planning. As it has taken us so long to decorate properly we spent a lot of time searching for the right elements to bring together. Through the secret Pinterest board we used it was easy to see that yellow, blue, pink and green were the colours we liked the most and so we have used them throughout the whole ground floor. 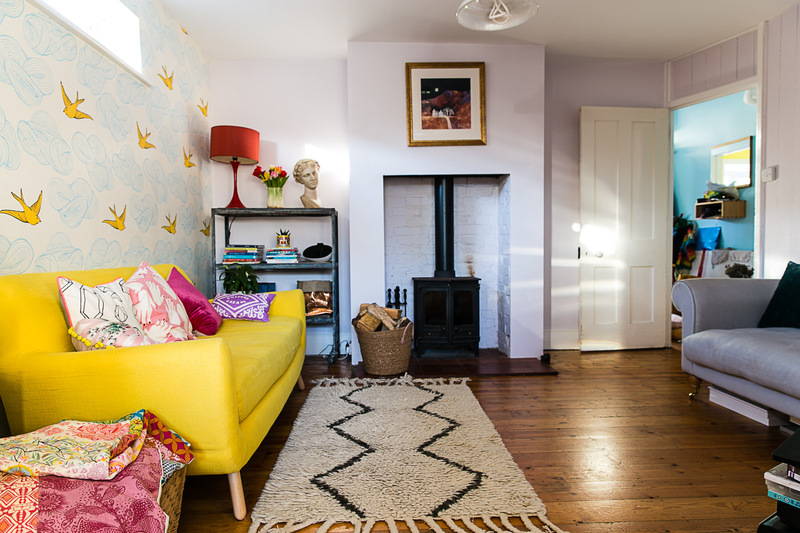 Of all the spaces we have transformed the sitting room is my favourite. It’s right in the centre of the house and where so much of family life takes place. It struggles for light as the kitchen extension took away its main window leaving it with a tiny slit window facing West. The bright light from our South facing kitchen somehow doesn’t make it all the way into here and maximising the light was a priority. There is a linked list at the bottom of this post for specific items so if there is something you fancy head on down there. I am crazy in love with this and after living with it and changing a few elements over the last few months I can tell you it works so well! Firstly the wallpaper. Oh the wallpaper! I have been a fan of this Julia Rothman print for Hygge & West for years. When I spotted the new colourway of yellow and sky blue it felt so right. It is definitely not a cheap option as on top of the price and shipping you can expect the import duty as well. This wall took three rolls to paper. We stripped it right back to the plaster in preparation and then our decorator lined it before hanging the paper. Pro-tip from Jake the decorator: hang the lining paper horizontally and you’ll avoid weird overlap seam marks on the finished wall. The wall colour is a slightly pink off-white (as Jake named it when we had it mixed) which when the sun floods in looks almost white but in the dark evenings is a warm pinky-purple. It took me by surprise how much the colour changed at first but the warmth in the darkness makes the room feel cosy. As the wallpaper was going up we knew that our old brown sofa just wasn’t going to sit right in the room so we bit the bullet and ordered a sofa. 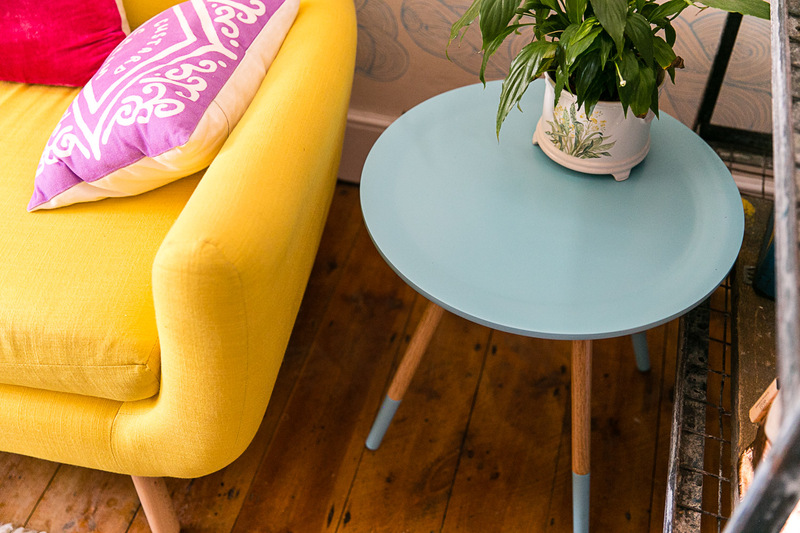 The big squashy sofas on our wishlist were our of our budget but this yellow one from Made.com was eminently affordable. The old sofa was eBayed and the yellow sofa took pride of place. I really appreciated those of you who gave us a heads up that a structured sofa might not be quite as comfortable, it really made us think. What we have found is that we sit differently on this sofa – no longer lounging and reclining but upright which has been great for my back. 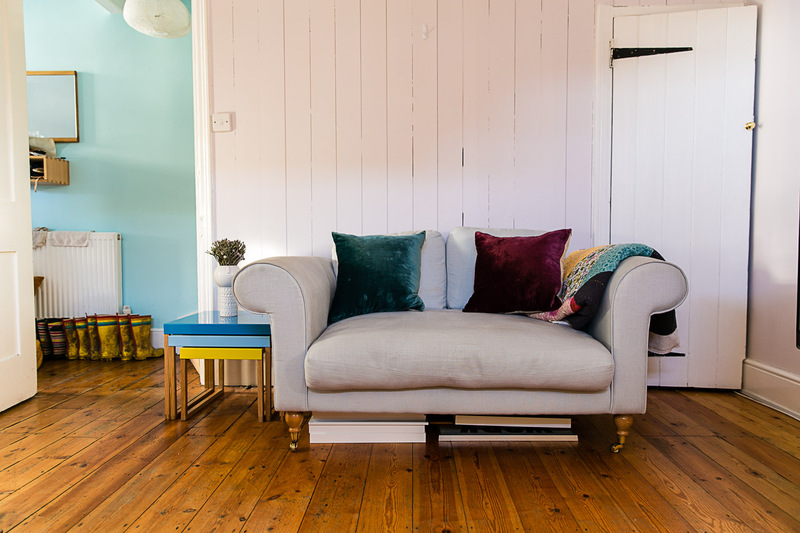 This sofa is so well proportioned that we don’t really need cushions on it but I can’t resist a cushion! I love how the different pinks work together with the yellow in this arrangement. 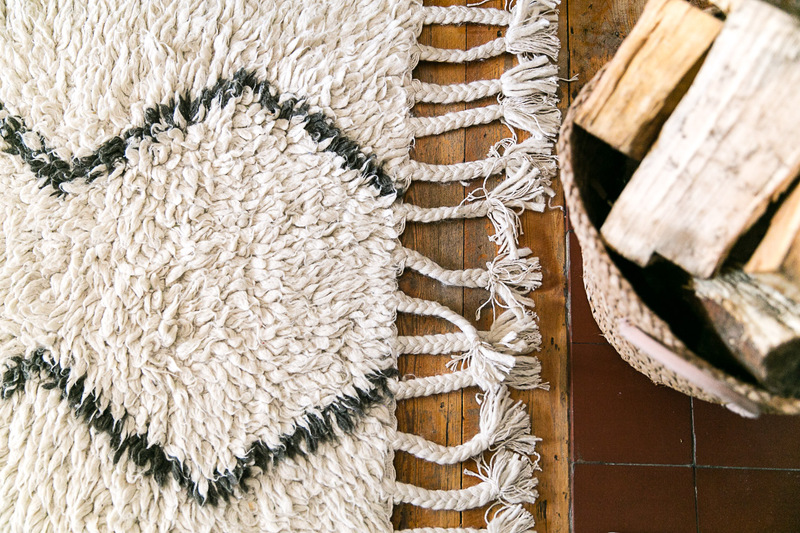 We lived with a little while before deciding that it positively needed a rug in front. The floor seemed a bit vast and it’s nice for the children to have something cosy to sit on when they play in here. After much deliberation we settled on this souk style beauty from West Elm. It is scrumptious to step onto and the texture it adds to the space makes a huge difference. Cosmo the Wondercat can often be found wrestling the tassels or rolling in the pile. 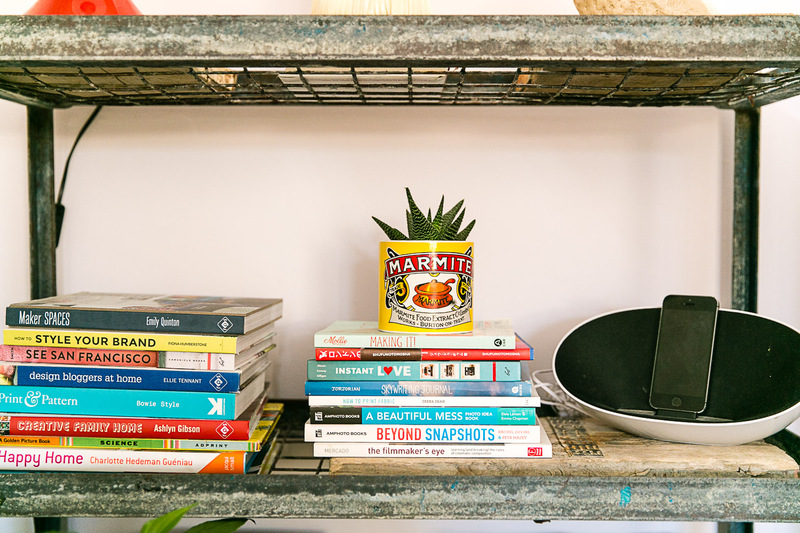 One of the biggest changes to the feel of the room has been taking the old bookshelf out and replacing it with these old metal shelves. I have had them for a while and as you can see in the before picture below we brought them into the room when we were prepping for decorating. They probably won’t look like this forever (especially not if I learn the art of shelf styling!) but for now I’m enjoying their sparseness. 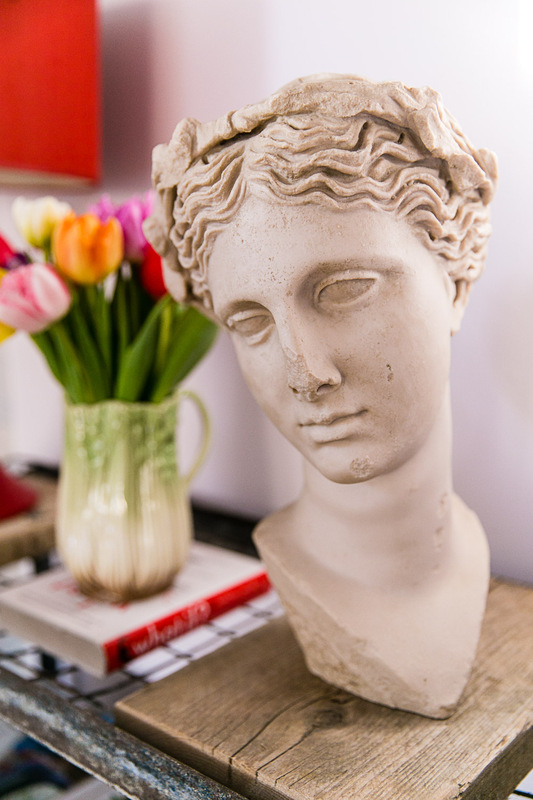 The bust was bought in the Vatican on my 21st Birthday, it’s the muse Thalia, and she hasn’t had a home in recent years. 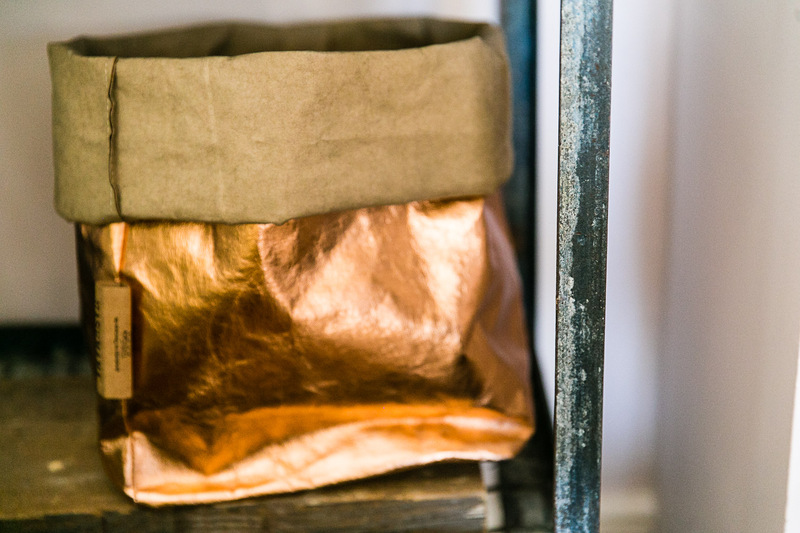 The rose gold paper bag is a sneaky way to hide the bits and bobs that accumulate and makes for a swift tidying spot when people come over. I have some sections of used scaffold planks on the wire shelves to give some stability, this may change but it’s working well for the moment. The lighting in this room is key. Often it is so dark during the Winter that we have the light on during the day. 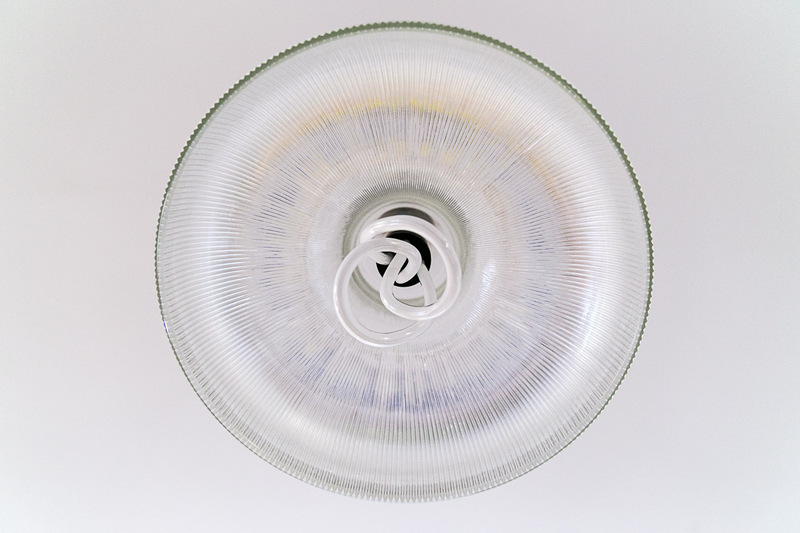 We chose this glass shade for its simple lines and to give maximum light in the space. I added a blue flex to tie in with the colour scheme and used a Plumen bulb because they look great. 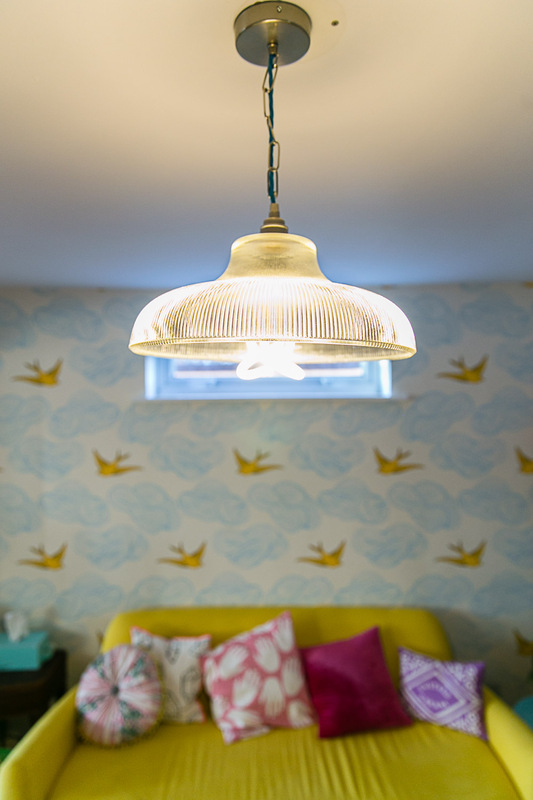 It could probably do with being a bit brighter which is the compromise for a good looking bulb I guess! The next phase of getting more light into the space is to paint the floor boards. The old varnish has worn through in many places and so we’re going to try white or light grey for both the sitting room and hall. I will update you once it’s done and our art has been hung (see all the frames under the blue sofa? We never do anything fast!). This is the biggest transformation of this decorating project and I think you can see why I saved it for last. Giving some love to the room where we come together for has made a massive impact on our home. 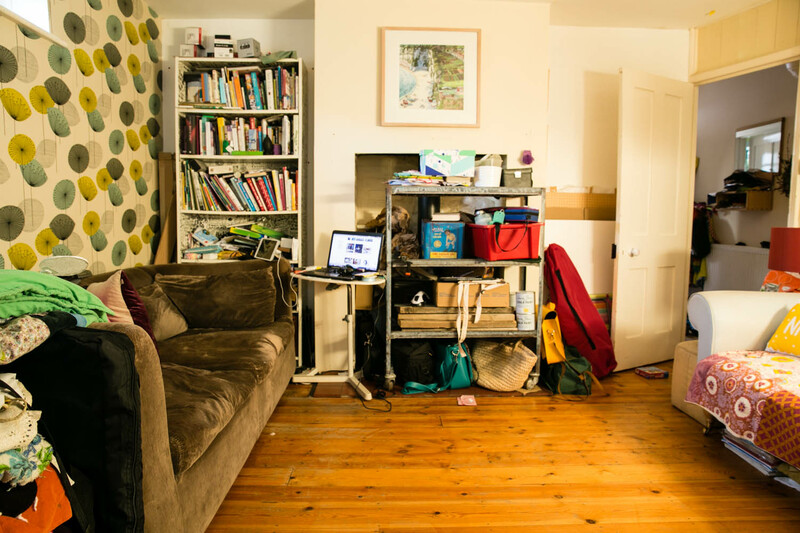 Not only that but tidying up has played a part in turning this into a relaxing place to be. This project is a supported by B&Q and Valspar who provided the paint & materials we used for the makeover. Labour, additional materials and furnishing model’s own. Kat, what a triumph! It’s gorgeous! Such a fantastic transformation. I really love it! Jennifer Grace recently posted…Sea Creature And Spaceship Toys – With Fimo Form & Play! Totally! Unless you’re there for ten years and then make it your own. really nice Kat! The room is beaming! It is so lovely. Well done. I love this room so much! I used that wallpaper in our bedroom (also a very dark room due to the teeny tiny window) and it brightens things up so much (although I also only did the one wall – mainly due to cost!!). 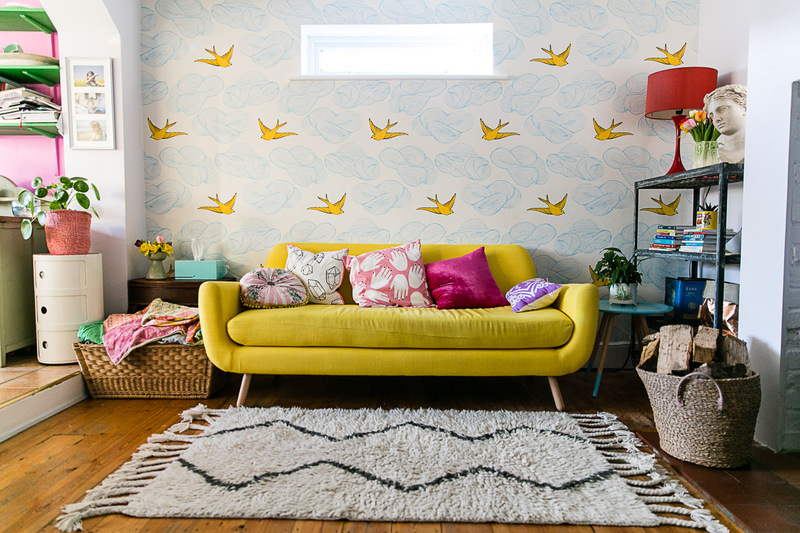 Your sofa is just amazing too – the whole room just looks so happy! Yes to the wallpaper!!! I just bought some from America and it was worth every penny – same company I think has the print! 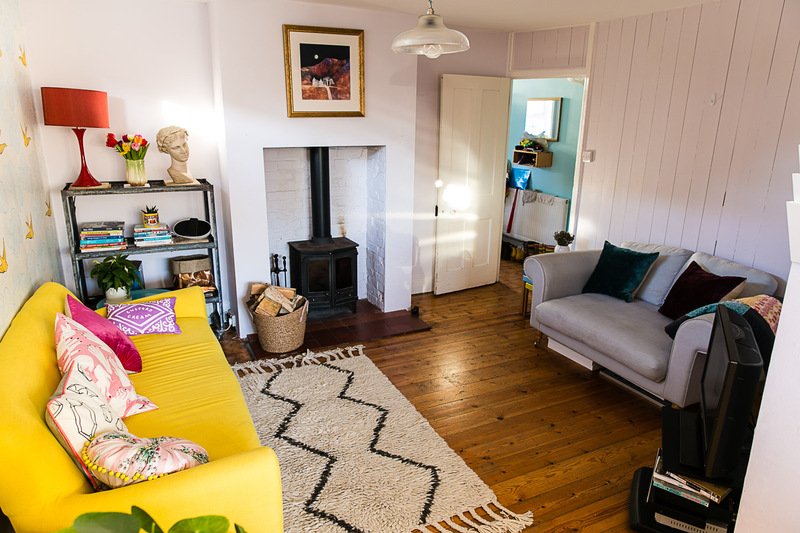 A real transformation, you must just love spending time in there, I am with you on the structured sofa – we got ours to stop the dogs recking the cushions when they hope on the sofa. Love that the theme in the room is you! This is absolutely beautiful! I am slightly obsessed with that vintage inspired Marmite pot as a candle, I have been thinking about doing the same with large mustard tins! 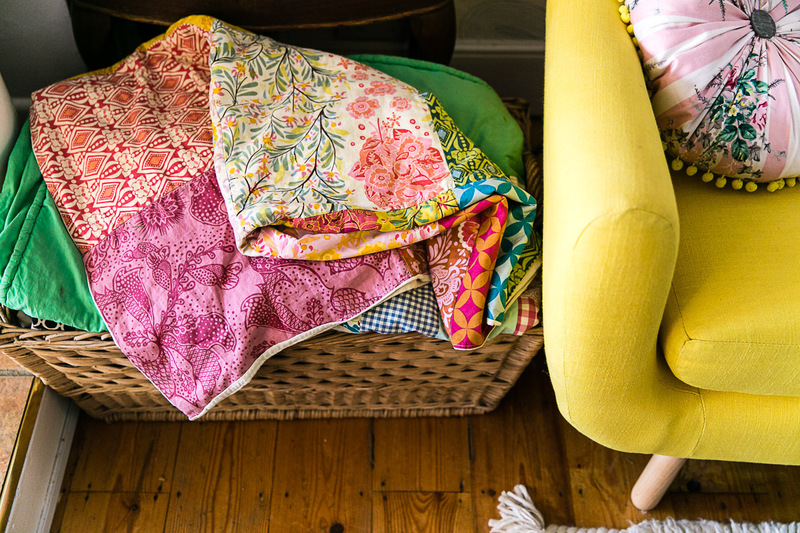 I can’t believe how amazing your home is – it’s full of so much character and charm. What a fantasticly inspiring room. The colours and textures make me happy just looking at it. Well done.